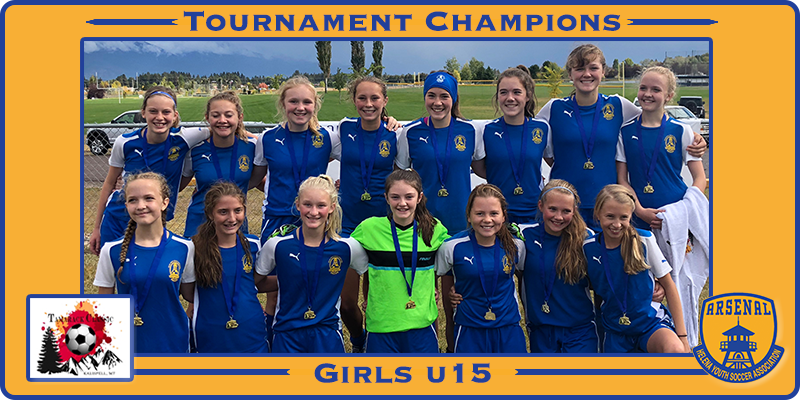 The Arsenal Girls U14/15 team returned home after a competitive weekend of soccer as the U14 Champions of the Tamarack Fall Classic in Kalispell after compiling a perfect 4-0 record. The team is jointly coached by Sean Lawlor, Joe Vranka, and Jamul Hahn. In bracket play on Saturday, Helena defeated the Flathead United White team 6-0 in an early morning match up. The afternoon game provided a tight defensive affair against a physical Sandpoint Strikers FC team which had the Arsenal girls pull ahead 1-0 late in the game on a penalty kick opportunity. Sunday had them competing twice against a fast and talented Flathead United Green team where they won 2-1 in bracket play in the morning. The championship game in the afternoon was an evenly played match with the teams trading goals throughout with Arsenal ultimately coming out on top 4-3. Offensively, Helena was paced by Tess Lawlor (7 goals/1 assist), Avery Kraft (1 goal/2 assists), Josie Esponda (2 goals), and Natell Goodman (1 goal) with additional assists from Astri Hahn and Isabelle Linder. Kaidyn Dolezal and Madison Hermes provided tenacity to the frontline as well. Strong midfield play was provided by Brogan Vranka (1 goal, 1 assist) and McCoy Vranka (1 goal, 1 assist). A very solid defensive line included Lauren Hoxie, Sydney Emmons, Morgan Hayes and Madison Burda. Minding the goal the majority of the weekend was Morgan Kaufman, who tallied two shutouts and a number of crucial saves. Including league play, the U14/15 girls are now 8-0 for the fall season.